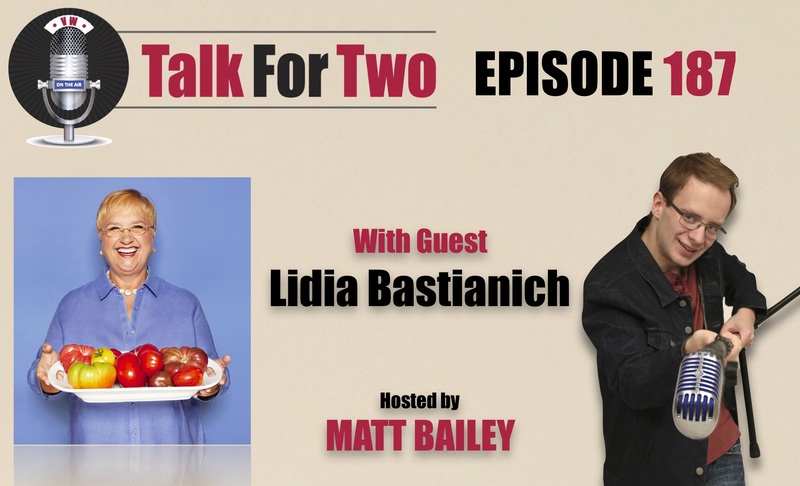 Matt Bailey welcomes his first celebrity chef guest, restaurant rockstar and television icon Lidia Bastianich! Lidia Bastianich has been called the matriarch of Italian-American Cuisine. She has been a staple personality on PBS for over 30 years, presenting cooking programs that teach easy and accessible recipes, recipes which have no doubt been tried in the homes of hundreds of millions of Americans. An Italian immigrant whose family fled a communist regime when she was just a young girl, Ms. Bastianich’s family settled in New York, where she would eventually begin her restaurant empire. With successful smaller restaurants in the outer boroughs, Ms. Bastianich and her then-husband Felice opened Felidia–a combination of the names ‘Felice’ and ‘Lidia’–which remains a flagship of the Bastianich’s family of restaurants. Her stable of restaurants also includes internationally-renowned restaurant-slash-Italian market Eataly, which has locations throughout the country. All of this and more is accounted with fascinating detail in Bastianich’s 2018 Memoir, My American Dream: A Life of Love, Family, and Food, which is still on shelves everywhere. In the book, readers will learn why Bastianich’s career continues to be second-to-none. Her work ethic, ability to take risks, and aggressive drive to achieve a vision of what cuisine could be sets an inspiring example for all. No matter if you’re a chef-in-training, or not interested in the food business at all, Lidia’s determination and grit cannot help but propel you to chase after your own American Dream. You will here Matt’s account of his time spent at Lidia’s restaurant Becco, as well as a years-long love of Eataly, which has scored points with a gluten-free member of his family. Plus, Lidia takes audiences on a dive into the differences, similarities, and magic of Italian versus Italian-American Cuisine. It is also worth noting that Lidia’s son is Joe Bastianich, who is the stern-but-fair judge on MasterChef. Lidia’s Kitchen continues to air on PBS, and recently began airing it’s 6th season. Clicking the link to the left will take you to some delicious recipes from the show!